Should'a ! Could'a ! Would'a ! I hear Tom saying,"Dear, ya better get up, we have a huge mess!" I bounded out of bed to a squish and a splash! I should have shook him awake, I could have, I had the thought. I would have but I talked myself out of it and now.....Ahh,hindsight!! We mopped for a couple of hours and went back to bed. At that point we thought it was contained in the laundry room where the pipe under the sink broke. When we got up this morning and surveyed the damage we realized how extensive it was. We have taken up all the pad and carpet from the bedroom, the wood in the hall closet is still oozing water, the wood in the hall is drying and we are hoping it won't buckle. We have unloaded the bookshelf in the family room, ready to take it apart to get the carpet dried under it. The water seeped to a few feet in the middle of that room. We are hoping to dry it out with a shopvac and some more fans. The house is pretty much in disarray and so I sit here and share the whole of it with my keyboard. Went to stake conference and heard a great talk by Nicki Olsen on how life is a test. Sure enough it is and I am "immersed" in it at the moment. But things always have an upside to them if we look. Like, this could have happened when we were out of town for the night. Tom could have slept straight through and it would have run another few hours. Some of it drained out in the laundry room floor so that's a plus. And it's just water, carpet, and a mess. No one is hurt or sick or dead! A mess can be cleaned up with patience! Well, that's the tale of our 2009 flood. I hope I get it all put together by Friday or I will have to re-schedule the Halloweenie Sleepover to next Friday. That would be ok as it would be the weekend of Halloween anyway! So, everyone out there, have a great day for me!!! I love October. Especially when the weather changes. But mostly because it is the month of Halloween!!! Yeah!!! Can a whole month have gone the wayside since I last visited this page? Apparently so! I would post pictures of our great trip to Colorado but alas, they are still safely secure in the camera. They are pretty boring anyway but when I do get them onto the computer, I may post some of the more scenic ones. We had a fabulous time, covering Zion National Park, up through Utah to Salt Lake and on over to Durango. Perfect weather most of the way, even through the desert. We left around 5:30 am and came back around 10:30 pm and it was cool both ways. Time has flown since returning home. Between grandkids, projects, volunteer stuff, and an elderly parent, I seem to wear myself out every day and have no problem sleeping the late evening away on the couch. I haven't even taken time to read a book this month!! How did that happen??! I am now in the throws of working out details for "Grama's Halloweenie SleepOver", scheduled for next Friday night. I am looking forward to it! 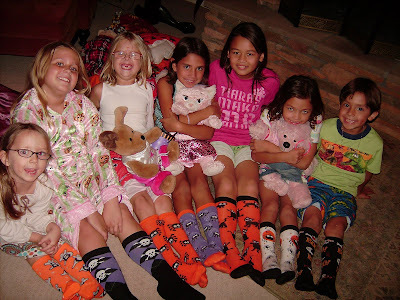 These pictures are from the 2nd year Sleepover, when we just had 4 little girls here and then the 3rd year (last year) when we had a few more. (I guess I lost the 1st year pictures when the computer crashed!) This year the guest list will remain the same. When you are in Kindergarten, then you get to come. So next year there shall be NINE! But for now only 7 will partake of the festivities!!! So Fun! !